This month, I share the news about an exciting new type of family legacy project we’re creating, as well as a link to the latest Legacy Video Lounge podcast! A “website on a drive” celebrates a unique family legacy. Family Legacy Video, Inc. prides itself on creating high-end, custom productions that help our clients preserve, celebrate, and share their life stories and values with current and future generations of their families. These legacy productions usually take the form of video and audio biographies. But occasionally, a project comes along that requires us to branch out, both technically and creatively, into other formats. We’re putting the finishing touches on a legacy project right now that’s a case in point. In 2017, a former client returned with a new challenge. Several years ago, we produced three legacy videos that centered around his wife and her family. Now he wanted to tell his family story. And quite a story it was, starting with Swedish ancestors who emigrated to the U.S. in 1867 and then homesteaded in southern Minnesota. They were hardy pioneers who carved out lives on a unforgiving prairie, creating a farm that stayed in the family for several generations. 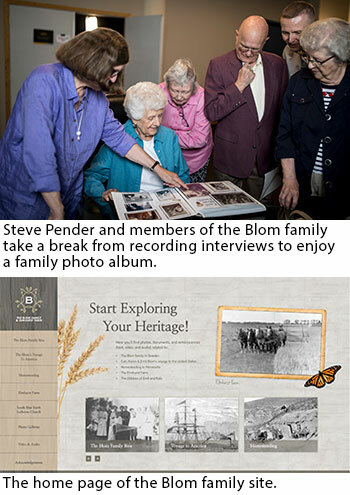 With the last generation to experience life on that farm now in their 80’s, my client wanted to capture and preserve their stories in a digital form that he could share with the younger generation of his family. My client brought lots of assets to the table: Newspaper clippings, family photos, documents, various booklets and publications, and some audio recordings of relatives from the previous generation who had since passed on. In addition, he wanted to shoot video interviews of the siblings and cousins of his generation who had lived on the farm – and who could give first hand accounts of farm and family life, and their parents, aunts, and uncles. The challenge was exciting, and I quickly realized that trying to include all the material in a video would be rather unwieldy – and probably extremely expensive. So how could I present his family information and assets in an entertaining, easily accessible, and reasonably economical way? I phoned my trusted website builder, outlined the challenge to him, and then asked, “Do you think we can incorporate this material into a site that would live on a flash drive?” My idea was to create a family web site consisting of pages of written information that would also feature internal links to the various documents, photos, and recordings that would help tell the family’s story. The website format would allow users to access information in a nonlinear way, at their own pace. And having the whole thing on a computer drive as opposed to the Internet would eliminate the need for domain name registration and web hosting and worrying about who in the family would keep the site alive in future years. After some thought, my web guru gave me the green light. My client loved the idea, and we were off and running. What followed were months of research, writing, scanning and organizing materials, recording and editing video interviews in Minneapolis, Minnesota and Tucson, Arizona, and digitizing and editing old audio cassette recordings. Once that was done, I worked with a gifted web designer, who created a beautiful look and feel for the site. She then handed it over to my web builder, who is now finishing up the site construction. The result will be a self-contained family history website, housed in a custom-engraved high-quality flash drive, a site we can modify in the future, if needed. Of course, no computer drive is archival, so I’ll be sure to recommend that family members make extra copies to guard against loss. This “family legacy website on a flash drive” project presented a fun and exciting challenge. And, once it’s done, we’ll be sure to add it to our already popular video and audio biography offerings. Episode 21 of the Legacy Video Lounge Podcast shares a couple’s memories about the beginning of a war – and the start of a loving marriage. Enjoy!